The Indoorgaudi 2009 is gaining more and more intrest in the helicopter idoor flying scene around Munich. This time we had a few more quadrocopters pilots as well. A good mixture of all types. 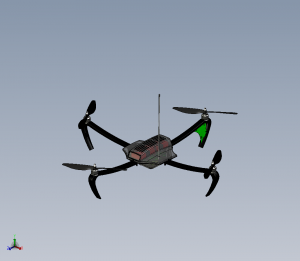 TT-copter, Mikrokopter, UAVP and the new Conrad Quadro as well. 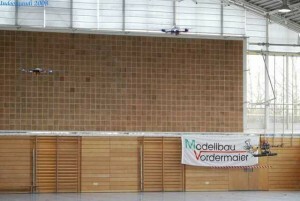 This is my 2nd time visiting the Indoorgaudi and the first public presentation of my quadrocopter with distance control. Some of you may know that i have tested this on a Mikrokopter 2 years ago in Ireland (klick!). 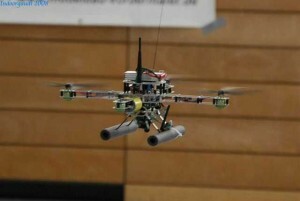 4 IR distatnce sensors and one for the hight control make this quadrocopter reacting to his environment. Just watch this video and tell me what you think. it’s not perfect as the code was just finished the night before and this was almost the first test flight. ButÂ you can see it’s working.